I never would have thought that an animated ‘Spider-Man’ movie would be the best in the series, but here we are. ‘Spider-Man: Into the Spider-Verse’ is the type of film that respects its superhero and history while also being entertaining and meaningful. It tells the story of Miles Morales (making his on-screen debut), and his own personal journey to become Spider-Man. Most comic book fans know that Peter Parker was not the only webslinger who has existed. Throughout the years, there have been many incarnations of Spider-Man, and most are represented in many different animation styles. While I am on the topic, the animation looks and feels like a comic book come to life with every moment seeming like I could read its every pages. As a superhero movie, the action is frenetic and the characters are well-realized. Along with Morales (Voice of Shameik Moore of ‘Dope’), we have an older Peter Parker (Voice of Jake Johnson), who serves as his mentor despite being a down-on-his-luck slob, Gwen Stacy/Spider-Gwen (Voice of Hailee Steinfeld), 50’s-style Spider-Man Noir (Voice of Nicolas Cage), anime-style Peni Parker (Voice of Kimiko Glenn), who is not without her spider-controlled robot, and the cartoony Spider-Ham (Voice of John Mulaney), as they join forces to get back to their dimensions after an experiment by the enormous super-villain Kingpin (Voice of Liev Schreiber) causes them to go to Morales’ universe, but they better hurry, because there is not much time. 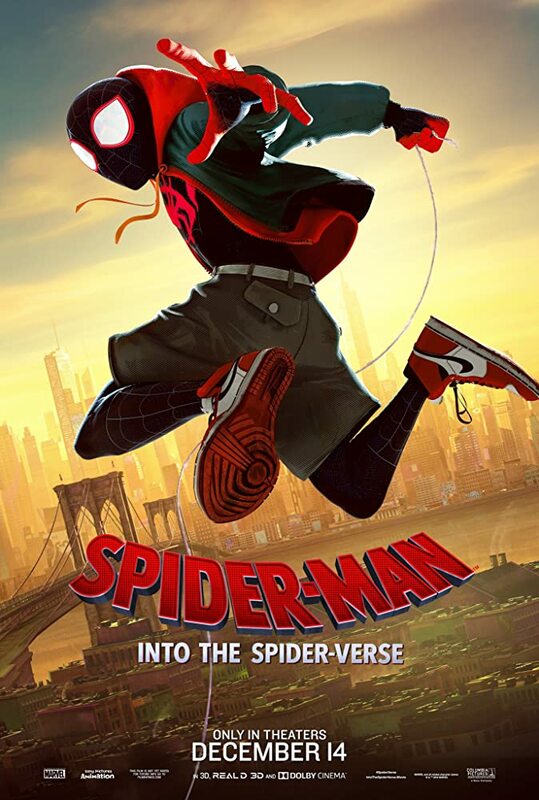 I really had fun with ‘Spider-Man: Into the Spider-Verse’ way more than any other ‘Spider-Man’ movie I have seen. It could be because of the animation, and/or its humor; seeing the many different incarnations of Spider-Man work off of each other is satisfying with each character given their chance to shine. All in all, this is more of Morales’ story. We have never had a Miles Morales film, and ‘Into the Spider-Verse’ is a perfect way for audiences to get introduced, and Marvel fans excited. Just because it’s an animated comic book movie does not mean that it cannot be fun, and ‘Spider-Man: Into the Spider-Verse’ delivers on all levels. Action, comedy, heart, and many other elements combine to make a film worth seeing, especially if you are a comic book fan.